The word calendar comes from the Latin word kalendae or the first day of the month. It was the day when priests called the new moon from the Capitoline Hill in Rome. It was also the day when debtors had to paid their debts inscribed in the kalendarium from which comes the word calendar. Calendars were used to organize days for religious, administrative and commercial purposes and to plan for agricultural cycles. For example, the beginning of the year in the Roman calendar was also the beginning of the agricultural season. The last day of the week was the day when farmers came to the city's market to sell their products. The first Roman calendar was a lunar calendar, based on the Greek lunar calendars where months begin and end when new moons occur. Because the time between new moons averages 29.5 days, the Roman lunar calendar had either 29 or 30 days. It had 304 days subdivided into 10 months starting from March and ending with December (from the Latin word decem or ten in Latin), while no months were assigned to the winter days between December and March. The second king of Rome, Numa Pompilius (reign: 715–673 B.C. ), introduced the months of Ianuarius (January) and Februarius (February). The year now had 355 days and the days of the months had either 29 or 31 days with February (28 days) being the exception. Because the year only had 355 days, it would quickly become unsynchronized with the solar year (also known as the tropical year). To solve this problem, days were periodically added to the month of February. The month of February was actually split in two parts. The first part ended with the Terminalia on the 23rd. Terminalia was in honor of the god Terminus or the god of boundaries and it celebrated the end of the religious year in the old Roman calendar. The second part consisted of the five days between the 23rd and the 28th. A leap month called the Mensis Intercalaris was inserted from time to time (usually every other year) between the two parts of February, thereby solving the calendar’s synchronization problem. This system of synchronization was far from perfect and Julius Caesar (100 BCΕ – 44 BCΕ) introduced the Julian calendar in 46 B.C. which consisted of 365 days and now started on January 1st. Due to the gradual shift in the orientation of Earth's axis rotation, a phenomenon discovered by Greek astronomer Hipparchus of Nicaea and known as the axial precession, the solar year is circa 20 minutes shorter than the time it takes the Earth to complete one full orbit around the Sun. Therefore it was necessary to add a day in the year after a number of years to better synchronize the calendar with the solar year. Emperor Augustus (63 B.C. - 14 A.D.) added a leap day to the month of February making the average length of the year 365.25 days. Yet this still did not make the calendar perfectly synchronized with the solar year, as the year in the Julian calendar was still a few minutes shorter. As a result, the year in the calendar gained about three days every four centuries. This problem of synchronization was solved and once and for good by the Gregorian calendar introduced by Pope Gregory XIII many centuries later in 1582. The solution was to remove the leap day to years evenly divisible by 100 but not evenly divisible by 400. For example, the year 1900 is evenly divisible by 100 (1900/100=19) but not by 400 (1900/400=4,75), therefore the month of February in the year 1900 has 28 days. In contrast, the year 2000 is evenly divisible by both 100 and 400 (2000/100=20 and 2000/400=5) therefore the month of February in the year 2000 has 29 days. The calendar that we all use today celebrates Roman, not Christian deities and a number of months are named after Roman gods. March, the first month of the year in the old Roman calendar, was in honor of the god of war Mars. While the origin of the word April (Aprilis in Latin) is unclear, some historians believe that it comes from the Etruscan word Apru meaning the goddess Aphrodite, thereby celebrating the goddess Venus (the Roman equivalent of Aphrodite) the goddess of love and fertility. May was in honor of the goddess Maia, the goddess of spring and plants while June was in honor of the goddess Juno. Juno was the wife of Jupiter, the god of light and sky and the protector of the state and its laws. January was in honor of the god Janus, the god of the beginning and of the end. February comes from the Latin word februare or to purify. It does not celebrate a god but was named in reference to the Roman feast of purification called Lupercalia (from the word lupus or wolf), which took place between February 13th and 15th. The feast’s purpose was to expel the evil spirits and to purify the city thereby bringing health and fertility. July and August do not celebrate deities but were named after Julius Caesar and Emperor Augustus respectively. July was previously named Quintilis (meaning fifth in Latin or the fifth month of the year in the old Roman calendar) until the Roman Senate named it July in honor of the Roman general Julius Caesar, July being the month of his birth. August was previously named Sextilis (the sixth month of the year in the old Roman calendar) in honor of Emperor Augustus who chose the month as it was the month of several of his great triumphs. September (from septem, seven in Latin) was the seventh month of the year in the old Roman calendar, October (from octo or eight in Latin) was the eighth month of the year, November (from novem or nine in latin) was the ninth month of the year, December (from decem or ten in Latin) was the tenth and last month of the year in the old Roman calendar. The old Roman calendar prior to the Julian calendar had an eight-day week just like the Etruscans. The eight-day week was the market week and ended with the day (called the nundinum, related to the word novem or nine as Romans counted days inclusively) when farmers came to the city's market to sell their products. Before the Julian calendar, the Romans did not name their days but marked them from A to H. One of the letters was the nundinal letter marking the market day. The nundinal letter changed every year as the year back then counted 355 days and as 355 was not a multiple of eight. When the seven-day week which named the days was introduced following the introduction of the Julian calendar, the eight-day week coexisted with the seven day week until Emperor Constantine officially adoped the seven-day week in 321 A.D. Sunday was the first day of the seven-day week and Saturday was the last. All of the days honored Roman deities. Sunday (dies Solis) was the day of the god sun Sol. Monday (dies Lunae) was the day of the moon and celebrated the goddess Luna. Tuesday (dies Martis) was the day of Mars, the god of war. Wednesday (dies Mercurii) was the day of the god Mercury. Thursday (dies Iovis) was the day of the god Jupiter. Friday (dies Veneris) was the day of goddess Venus. Saturday (dies Saturni) was the day of god Saturn. In Latin languages such as Italian, French or Spanish, there is an obvious similarity between the days' names and the Roman gods' names. In Italian Tuesday is Martedi and Thursday is Giovedi. In French, Tuesday is Mardi, Wednesday is Mercredi (day of Mercury). Therefore these languages, the days of the week honor Roman, not Christian deities. January The eleventh month of the year in the ancient Roman calendar. In honor of the god Janus, god of the beginning and end. February The twelfth and last month of the year. From the Latin word februare to purify. In reference to the Lupercalia, the Roman feast of purification. March First month of the year. In honor of the god of war: Mars. April In honor of the god Venus. Comes from the Etruscan word Apru meaning Aphrodite. May In honor of the goddess Maia, the goddess of spring and plants. June In honor of the goddess Juno, who was the wife of Jupiter. July In honor of Julius Caesar. August In honor of emperor Augustus. September Initially the seventh month of the year. From septem in Latin. October<?font> Initially the eight month of the year. From octo or eight in Latin. November Initially the ninth month of the year. From novem or nine in Latin. December Initially the tenth month of the year. From decem or ten in Latin. Monday Dies Lunae, day of the moon and of the goddess Luna. Tuesday Dies Martis, day of Mars, the god of war. Wednesday Dies Mercurii, day of Mercury, the god of financial gain, commerce, eloquence, communication and divination, of travelers, boundaries, luck, trickery and thieves, and the guide of souls to the underworld. Thursday Dies Iovis, day of Jupiter, the king of the god and the god of sky and thunder. Sunday Dies Solis, day of the sun god Sol. The original purpose of the calendar was to properly time and plan for the various religious holidays. At the beginning of each month, priests called the new moon and announced the calends from the Capitoline Hill. They also announced the number of days to nones and the ides, both days of religious observance. The nones was the day of the half moon. It was six days after the calends in May, October, July and March, and only four days later for the other months. Ides was approximately in the middle of the month and the day of the full moon. It was always eight days after the nones. The Pontifex Maximus, the high priest of the College of Pontiffs or the equivalent of the Pope today, determined when a leap month (Mensis Intercalaris) was to be inserted. 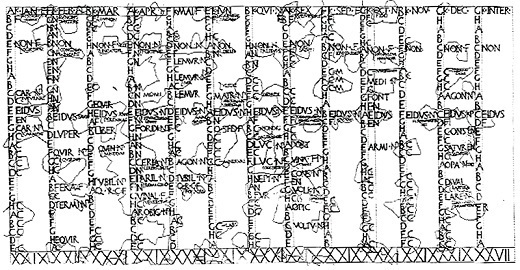 Romans counted the days of the month very differently from us. We count the days after the first day of each month for example, we say "it is June 22nd". By contrast, the Romans counted the number of days to certain dates such as the calends, the ides and the nones. 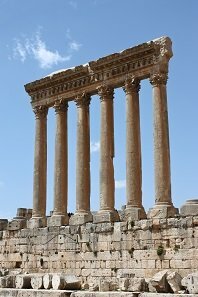 Instead of saying "it is June 22nd", the Romans would say "it is the 10th of the calends of July. The 10th because the Romans counted days inclusively (10 days to July 1st, counting the 22nd and July 1st). The Romans identified the years by the name of the two consuls holding office in a specific year. For example, they would say "it is the year of consuls X and Y". In the first century B.C., Marcus Terentius Varro, an ancient Roman scholar and writer, introduced the AUC system (from Ab urbe condita or “from the founding of the City" in Latin) which assumed a foundation of Rome (“the City”) in 753 B.C. The AUC system was commonly used in the Empire alongside the consular year. There were many holidays in the ancient Roman calendar and most of them were religious. There were many fixed holidays or feriae stativae and many feriae conceptivae which were holidays with no fixed dates, the dates being decided by the priests. The Saturnalia was celebrated from the 17th to the 23rd of December and it was a holiday where Romans would party, treat everybody equal and exchange gifts. Interestingly, when the Romans adopted the Christian faith the tradition of exchanging gifts remained. Lupercalia which took place between February 13 to 15th was the Roman feast of purification. Its purpose was to expel the evil spirits, purify the city and bring health and fertility. February also had a feast in honour of the Ghosts of the dead called the Feralia which is the reason why Romans would never get married in February. Romans also had religious holidays in March and in October to celebrate the beginning and end of the war season. Wars could only take place between March and October when the weather was good and food resources were not limited. The Ambarvalia was a holiday with no fixed date in the ancient Roman calendar, one of the feriae conceptivae, which celebrated the coming of Spring (around the date of our Easter today). All days and a number of months celebrate Roman deities. The origin of the month of April is unclear, some historians believe it comes from the Etruscan word Apru meaning the goddess of love and fertility Aphrodite, while others believe that the word comes from the Latin word aperiō meaning to open, April being the month when the Earth opens to receive seed. During the Roman Kingdom, even numbers were considered unlucky, and only February was allowed to have an even number of days as it was the month of purification. Romans would not want to get married in February and in the second half of June, June being the month of the goddess Juno. The Pontifex Maximus had the authority to lengthen the year and because he was often involved in Roman politics, he would sometimes lengthen the year if his political ally was in power. For example, the year of the third consulship of Julius Caesar in 46 B.C. lasted 445 days long. Our current calendar is actually not the Julian calendar but the Gregorian calendar introduced by Pope Gregorius (540 - 604 A.D.) in the Middle Ages. Currently the difference between the Julian and the Gregorian calendar is 13 days. The tradition of exchanging gifts on Christmas comes from the Saturnalia holiday and not from the Christian tradition.